As part of the industry-wide shift from a fee-for-service care model to a value-based one, the Centers for Medicare & Medicaid Services (CMS) and many commercial payer organizations today leverage risk adjustment as a way to predict patient health costs and adjust reimbursement rates accordingly. For healthcare organizations who are increasingly taking on risk-based contracts, accurate coding is critical to ensuring accurate risk scores and reimbursements. 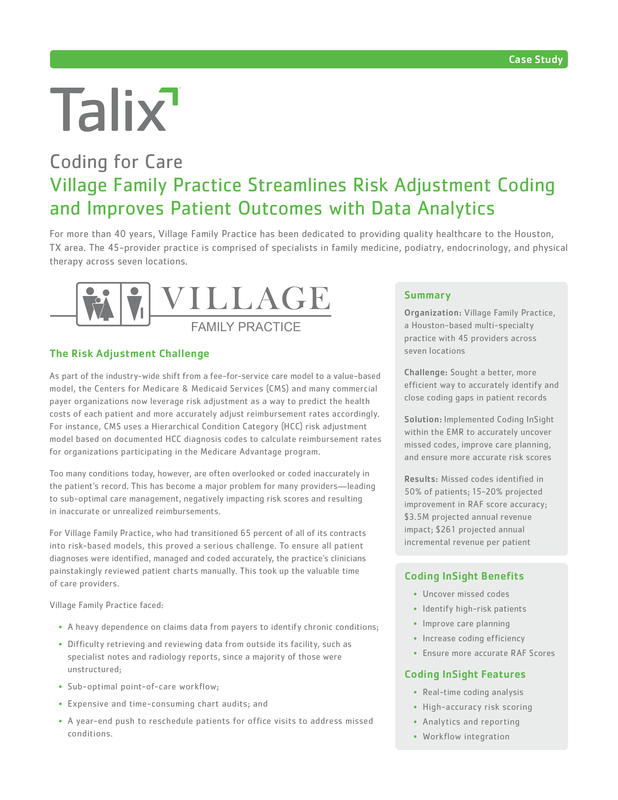 In this case study, learn how Village Family Practice, a Houston-based multi-specialty practice with 45 providers across seven locations, implemented an analytics-driven coding tool to tackle the challenges of risk adjustment coding—improving coding efficiency, risk score accuracy, care planning, and overall patient outcomes. The result: 15-20% improvement in RAF score accuracy and $3.5 million in annual revenue impact.